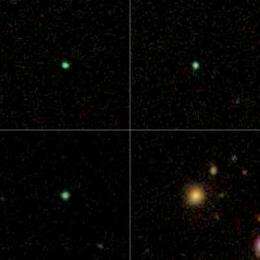 A team of astronomers has discovered a group of rare galaxies called the "Green Peas" with the help of citizen scientists working through an online project called Galaxy Zoo. The finding could lend unique insights into how galaxies form stars in the early universe. "These are among the most extremely active star-forming galaxies we've ever found," said Carolin Cardamone, an astronomy graduate student at Yale and lead author of the paper, to be published in an upcoming issue of the Monthly Notices of the Royal Astronomical Society. Of the one million galaxies that make up Galaxy Zoo's image bank, the team found only 250 Green Peas. "No one person could have done this on their own," Cardamone said. "Even if we had managed to look through 10,000 of these images, we would have only come across a few Green Peas and wouldn't have recognized them as a unique class of galaxies." "They're growing at an incredible rate," said Kevin Schawinski, a postdoctoral associate at Yale and one of Galaxy Zoo's founders. "These galaxies would have been normal in the early universe, but we just don't see such active galaxies today. Understanding the Green Peas may tell us something about how stars were formed in the early universe and how galaxies evolve." "This is a genuine citizen science project, where the users were directly involved in the analysis," Schawinski said, adding that 10 Galaxy Zoo volunteers are acknowledged in the paper as having made a particularly significant contribution. "It's a great example of how a new way of doing science produced a result that wouldn't have been possible otherwise." After reading the posted paper (and participating in the Galaxy Zoo project)it would seem that these objects are the precursors to Luminous Blue Compact Galaxies (LBCG) that we see today in our local universe. Hopefully radio observations of these galaxies are under way to determine neutral hydrogen (HI) abundances in their proximity, given the high star formation rate. Great to see these results formally published. The paper mentions that these the reason for the strong green appearance (in SDSS gri color composites) is the very prominent OIII emission in these objects (the redshifted OIII line is mapped as green for the red part of the 'gri' images presented in Galaxy Zoo). Spectral resolution of this line indicates a velocity dispersion on the order of 1000 km/s!, another indicator of vigorous star formation in these galaxies. These objects also resemble nearby cousins of more distant Lyman-alpha emitters (LAEs) and Lyman-Break Galaxies (LBGs), offering insights into these distant star forming galaxies.Hopefully the refurbished Hubble along with Herschel may provide answers (and probably more questions) about the physical state and history of this rare subclass of galaxies. Congrats to all at GZ.